Foster Brooks (May 11, 1912 – December 20, 2001) was an American actor and comedian best known for his portrayal of a lovable drunk in nightclub performances and television programs. Foster Brooks was born in Louisville, Kentucky on May 11, 1912 to Edna (née Megowan) and Pleasant M. Brooks. He had seven brothers. His career started in radio, notably with station WHAS (AM) in Louisville. He was a staff announcer, and his deep baritone voice was also well-suited for singing. Brooks gained fame for his reporting of the Ohio River flood of 1937, where he was featured on emergency broadcasts by WHAS and also WSM (AM) from Nashville, Tennessee. In 1952, Brooks appeared on local TV in a short-lived spoof of Gene Autry and his "Singing Cowboys". He later worked in local broadcasting as a radio and TV personality in Buffalo and Rochester, New York, before moving to the West Coast to launch a career as a stand-up comic and character actor. In Buffalo, Brooks performed with a country and western vocal group known as the Hi-Hatters. In 1960, Brooks moved with his family to Los Angeles to seek more professional opportunities. During this time, he appeared on the television comedies The Munsters, The Monkees and Bewitched. Brooks also delivered Christmas mail and phone books, and managed an apartment building in North Hollywood. In addition, he worked as a security guard for the Los Angeles Dodgers baseball team. On the syndicated Steve Allen Show of the 1960s, Allen introduced Brooks as an important movie producer. Brooks stumbled on stage doing his drunk act, fooling some of the other guests. Brooks claimed to be the executive in charge of editing movies for television. His biggest success, he said, was the famous movie The Three Commandments. His character also claimed to have invented the concept of removing clips from the movies and inserting commercials. In 1969, game show host and television announcer Dennis James introduced his friend Brooks at a North Carolina charity golf tournament to tell some jokes, leading to Brooks' discovery by singer Perry Como, who in turn gave the comedian his major break. Como chose Brooks to open for him at a Las Vegas hotel. When the hotel's owners balked at Como's choice due to Brooks' age and lack of fame, Como insisted and the owners acquiesced. Brooks was an instant hit. He made his first appearance soon thereafter on The Tonight Show Starring Johnny Carson. Brooks regularly appeared on The Dean Martin Show television program in the 1970s (for which he garnered an Emmy Award nomination in 1974) as well as many situation comedies, talk shows, and a few films. His signature routine was the basis of a hit comedy album titled Foster Brooks, The Lovable Lush (later retitled Los Angeles Earthquake), released in the early 1970s. As his "Lovable Lush" character, Brooks usually portrayed a conventioneer who had had a few too many drinks — not falling-down drunk, but inebriated enough to mix up his words and burp to comedic delight. Brooks is most affectionately remembered for his appearances on The Dean Martin Celebrity Roast during the 1970s, where he roasted other comedians, such as Don Rickles, Johnny Carson and Lucille Ball, or serious personalities such as author Truman Capote or consumer activist Ralph Nader. Brooks drew upon his own battles with alcohol for his act. During his period of greatest fame, Brooks rarely drank. Of giving up drinking to win a bet in 1964, Brooks said, "A fellow made me a $10 bet I couldn't quit, and I haven't had a drink since. At the time I needed the $10." He would occasionally make cameo appearances in which his character was perfectly sober, such as his appearance in a 1968 episode of Adam-12 playing a strait-laced citizen who tries to get out of a parking ticket by dropping the name of an officer senior to the main characters. He also played the character Harry Sachs in a 1969 episode of Adam-12 in which he performed as a highly intoxicated man standing in the middle of a street, waving his suit jacket at oncoming traffic, as if he were a bullfighter. In a later Adam-12 episode, he plays a stoned man, stopped for erratic driving, who tries to hide the burning marijuana "joint" in his suit's front pocket. In a more serious Adam-12 appearance, he portrayed a drunken driver who killed another driver in an accident on Christmas Eve. On the comedy series Green Acres in the 1969 episode "Economy Flight to Washington", Brooks' boozy, bobble-headed character meets and befriends the pig Arnold Ziffel in a hotel bar. In the scene, ostensibly through the haze of alcohol, Brooks mistakes the anthropomorphic pig for a US Air Force lieutenant, since the animal is sitting on a barstool and is wearing a white leather aviator's cap, goggles, and a red scarf. Brooks acted again on Green Acres in 1969, this time giving a "sober" performance as Charlie Williams, a chemist, in the episode "The Milk Maker." The following year he returned to his whiskey-soaked persona on the television western The High Chaparral. Brooks asked Dean Martin to join his group "Alcoholics Unanimous", a play on Alcoholics Anonymous. He boasted he and Martin were charter members of the DUI (Driving Under the Influence) Hall of Fame. In 1979, Brooks appeared in the film The Villain as a bank clerk. Public sensibilities had changed regarding alcoholics and public drunkenness by the 1980s, so Brooks moved away from his drunken character. In 1983, Brooks appeared in the film Cannonball Run II with comedians Louis Nye and Sid Caesar as fishermen in a rowboat. He had a recurring role as Mr. Sternhagen, Mindy's boss on Mork & Mindy. His name was a moniker on a Louisville celebrity golf tournament benefiting Kosair Charities. Brooks was a Shriner and member of the Al Malaikah Shriners, Los Angeles. He also made occasional guest appearances on TV shows in which he would demonstrate his singing voice. Brooks' last performance was at a celebrity roast in Las Vegas for Zsa Zsa Gabor. Years later Brooks was referred to on the Cartoon Network television show Space Ghost Coast to Coast (episode 45, "Switcheroo II"). He was featured in a scene that was cut before being aired, but the scene was later included on the Space Ghost Coast to Coast volume 3 DVD release. He is also referenced on an episode of Get a Life called "Paperboy 2000". On the March 1, 2010, episode of The Daily Show, Jon Stewart referred to Senator Sheldon Whitehouse's mispronunciation of a constituent's name by saying, "It's not supposed to end on a Foster Brooks hiccup." Brooks was first married to Loretta Brooks, with whom he had a son and three daughters: F. Richard, JoAnn and Patricia, as well as Diane, who died in infancy. Foster and Loretta divorced in 1950. That same year, he married Teri Brooks, with whom he had two daughters, Scotti and Teri. Brooks' brother, Tom, was a well-known entertainer in Louisville for many years. Tom Brooks played "Cactus", a hayseed character and sidekick to Randy Atcher on T-Bar-V Ranch and Hayloft Hoedown, and was an off-screen announcer on WHAS-TV for many years in the 1950s and 1960s. Brooks died on December 20, 2001, at his home in Encino, California, from heart failure. He was 89 years old. ^ a b Kleber, John E., ed. (2001). "Brooks, William Thomas "Cactus"". The Encyclopedia of Louisville. Lexington, Kentucky: University Press of Kentucky. p. 131. ISBN 0-8131-2100-0. OCLC 247857447. Retrieved February 9, 2017. ^ a b c d e f g Lueck, Thomas J. (December 24, 2001). 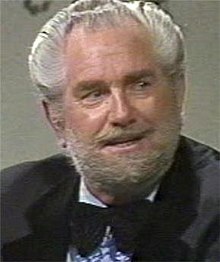 "Foster Brooks, 89, Comedian Known for His Tipsy Persona". The New York Times. Retrieved December 13, 2015. ^ Foster Brooks on the Steve Allen Show, retrieved September 1, 2017. ^ Erwin, Fran (June 9, 1977). "Celebrity at home: Foster Brooks; Comedian and 'demon booze' team to make a staggering success". Valley News. Van Nuys, California. p. 49. Retrieved February 9, 2017 – via Newspapers.com. ^ Foster Brooks roasts Ralph Nader on Dean Martin Roast, February 15, 1974. ^ a b Scott, Vernon (March 4, 1974). "Foster Brooks, Drunk, Not a Drinker". Nashua Telegraph. Retrieved February 9, 2017 – via news.google.com. ^ "Foster Brooks appears at American Legion Dinner". Boca Raton News. February 19, 1990. Retrieved February 9, 2017 – via news.google.com. ^ Mark Keizer. "Space Ghost Coast to Coast: Volume 3 review". dvdfile.com. Archived from the original on September 28, 2007. Retrieved January 22, 2016. ^ "Foster Brooks in the 1940 Census". Ancestry.com. Retrieved February 9, 2017. ^ "Loretta M. Brooks Obituary". Legacy.com. December 27, 2006. Retrieved February 9, 2017. This page was last edited on 7 February 2019, at 09:39 (UTC).